We’ve been looking forward to visiting Hinsdale Campground at Thicket Hill Village ever since we found out about it at a Camping/RV show early last spring. They also have a great website, which we visited several times before finally making reservations for a long weekend. Hinsdale Campground is located in the southwestern corner of New Hampshire, about 5 miles east of Brattleboro, Vermont on NH Route 119. Finding it was a bit confusing… while the campground had a highly visible sign on Route 119, when you entered the property you’re first confronted with a well worn mobile home development (Thicket Hill Village)… a little disenchanting when you’re looking to get away and disconnect from reality. Nonetheless, after passing thru the development we came to the campground entrance… a gated booth with gates up and no attendant. We continued in and drove around the park until we saw an attendant trying to catch up to us in a golf cart. Once she did she politely explained that we needed to check in at the gate. She suggested that I leave our motorhome and she would drive me back to the gate to sign in. I signed in and she drove me back to our RV and we followed her to our site. Hinsdale Campground is a relatively new park with about 50 sites. Once you climb a very steep entrance grade, you’ll find the entire campground property is located in a flat, wooded area. Individual sites are gravel, fairly level and a comfortable size. There are plenty of mature trees throughout the park offering filtered sunlight, but not real shade. Some of the sites have a little vegetation between them to add to the privacy. Each site has a large picnic table, fire ring with BBQ grate and a trash barrel. One nice touch is that every site has a small street lamp that automatically goes on at dusk. Several “wilderness sites” are also available. The interior roads at this campground are well maintained gravel and extremely wide, some of the widest we’ve seen, making it very easy to navigate even the largest rig. All sites are back-in, there are no pull-thrus. Every site is well marked and most are full hook-ups, including free cable TV. 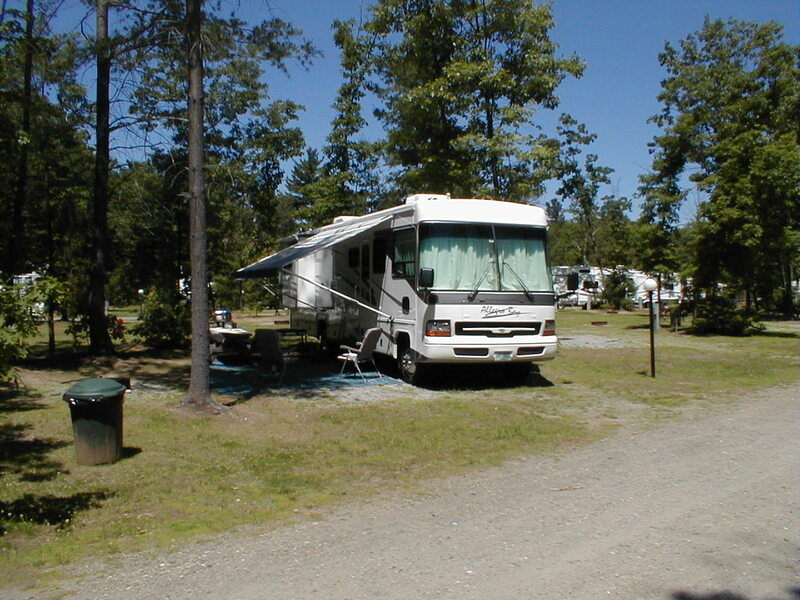 As a newer campground, the facilities are clean, comfortable and well maintained. The private showers are free and include a dressing area. The restrooms are large and comfortable. A washer and dryer are also available near the rest rooms. The campground has a very nice large heated pool with a kiddie pool right next to it. An open pavilion sits right next to the pool and includes two community gas grills. Next to the pavilion is a gated, completely fenced in kids playground… very nice if you’ve got little ones that tend to wander off. Currently they don’t have a campstore, so bring what you need before you get here. There were a few seasonal campers here and for the most part, their sites are well maintained. But several seasonal sites could stand a bit of “housekeeping”, including the manager’s. (hide the maintenance equipment, don’t put it on display). Hinsdale Campground does allow pets. When we were there it seemed like one out of three campsites had a dog… some had two. We love pets, we have two dogs and a cat ourselves, but one family left their dog unattended while they spent time at the pool, and it was obvious their dog missed them. Other than that, this is a very quiet, comfortable campground. By 10pm on Saturday night, only a single campfire was still burning. During our stay, a section of the campground was undergoing major expansion. There were dirt piles, freshly spread topsoil and other construction material scattered about. Ordinarily, we would comment on the negative visual quality of a campground when we find scattered machinery and maintenance equipment, but it’s understandable in this case because it’s an active expansion. If the existing quality is any indication of things to come, Hinsdale Campground has the makings of a first class park. We are planning to stop back here in a year or two to see what’s new.